The Curtiss-Wright Model 21 (also known as the Curtiss-Wright Model 21 Demonstrator, the Curtiss-Wright CW-21 Interceptor, the Curtiss-Wright CW-21 Demon) was a United States-built interceptor fighter aircraft, developed by the St. Louis Airplane Division of Curtiss-Wright Corporation during the 1930s. The CW-21 was not commissioned by the U.S. military, though it was test flown at Wright Field in Dayton, Ohio. The Army Air Corps immediately rejected the aircraft, with one officer commenting that it took a genius to land it. Instead it was developed for export sales by the St. Louis Airplane Division of Curtiss-Wright. The aircraft was a single seat, all-metal cantilever low-wing monoplane with rearward retracting landing gear. The Model 21 was powered by a 1,000 hp (746 kW) Wright Cyclone nine cylinder air-cooled radial Wright R-1820-G5 engine. The Model 21 was designed by George A. Page, Jr. based on Carl W. Scott's design of the two seater Model 19. The prototype first flew in January 1939 and bore the civil experimental registration NX19431. The prototype was designed to carry various combinations of two 0.3 or 0.5 in (7.62 or 12.7 mm) machine guns, mounted in the nose and synchronized to fire through the propeller. The first sale of the CW-21 Demon in 1939, was to the Chinese Air Force, which received three completed examples and kits for 32 more. Assembly would be undertaken by the Central Aircraft Manufacturing Company (CAMCO) at Loiwing, near the China-Burma border. These were armed with two machine guns: one .50 caliber (12.7 mm) and one .30 caliber (7.62 mm). Three CW-21s were furnished to the Chinese as kits, assembled in Loiwing, and delivered to the 1st American Volunteer Group (Flying Tigers). These crashed and were destroyed, due to poor visibility, on a flight from Rangoon to Kunming on 23 December 1941. In 1940, the government of the Dutch East Indies (Indonesia) ordered 24 examples of a modified version designated the CW-21B from Curtiss-Wright (together with a number of Curtiss-Wright CW-22 trainers), for the Militaire Luchtvaart van het Koninklijk Nederlands-Indisch Leger ("Military Aviation of the Royal Netherlands East Indies Army"; ML-KNIL). The modifications consisted of: inward-retracting main landing gear, a semi-retractable tail wheel, an armament of two 7.62 mm and two 12.7 mm machine guns, and a slightly larger fuel tank. The CW-21B was also 13 km/h (8 mph) faster than the preceding model at sea level. Deliveries started in June 1940, but only 17 had been received by Vliegtuigroep IV, Afdeling 2 ("Air Group IV, No. 2 Squadron"; 2-VLG IV), when war with Japan began on 8 December 1941. 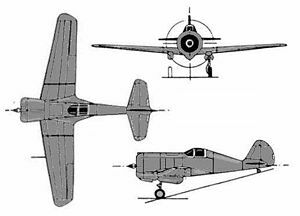 With its light construction, radial engine, low wing loading, limited pilot protection and lack of self-sealing fuel tanks, the CW-21B was the Allied fighter most similar to the opposing Japanese fighters. It had a rate of climb superior to the Nakajima Ki-43 ("Oscar") and Mitsubishi A6M ("Zero"). The CW-21B had similar firepower to the "Oscar", but worse than the cannon-armed "Zero". 2-VLG IV claimed four aerial victories during the Netherlands East Indies campaign but the ML-KNIL was overwhelmed by the sheer number of Japanese; almost all of its fighters were soon lost in combat or destroyed on the ground. After the Dutch East Indies fell, the Japanese acquired a CW-21B, which was used as a liaison aircraft in the SE Asia area. Japanese photos were found showing it at an airfield on Singapore Island. Interceptor. One prototype built in 1938 (c/n 21-1 / NX19431). Three production units : NX19441 (c/n 21-2); NX19442 (c/n 21-3); NX19443 (c/n 21-4). 27 sets of components were sent to China to be assembled by CAMCO. Easily identifiable by the Seversky P-35 type of main undercarriage fairings. Interceptor. Proposed design to utilize the Alison V-1710. Not built. Interceptor. A total of 24 built for the Netherlands East Indies (c/n 2853 to 2872, NEI serials CW-344 to CW-363). It was easily identifiable by the inward retracting main landing gear that eliminated the need for the undercarriage fairings notable on the Model 21. Imperial Japanese Army Air Force operated captured ex-Dutch aircraft. Angelucci, Enzo and Peter M. Bowers. The American Fighter: The Definitive Guide to American Fighter Aircraft from 1917 to the Present. New York: Orion Books, 1987. ISBN 0-517-56588-9. Bond, Charles R. and Terry H. Anderson. A Flying Tiger's Diary. College Station, Texas: Texas A&M University Press, 1984. ISBN 0-89096-408-4. Bowers, Peter M. Curtiss Aircraft 1907-1947. Annapolis, Maryland: Naval Institute Press, 1979. ISBN 0-87021-155-8. Casius, Gerald. "The St Louis Lightweight". Air Enthusiast Number 16, August-November 1981. Dean, Francis H. and Dan Hagedorn. Curtiss Fighter Aircraft: A Photographic History, 1917-1948. Atglen, Pennsylvania: Schiffer Publishing, 2007. ISBN 0-764325-80-9. Edwards, Walter Dumaux. They Fought with What They Had: The Story of the Army Air Forces in the Southwest Pacific, 1941-1942. Washington, D.C.: Center for Air Force History, 1992 (first edition 1951). ISBN 0-80949-758-1. Ford, Daniel. Flying Tigers: Claire Chennault and His American Volunteers, 1941-1942. Washington, DC: Harper Collins|Smithsonian Books, 2007. ISBN 0-06124-655-7. Green, William. War Planes of the Second World War, Volume Four: Fighters. London: MacDonald 7 Co.(Publishers) Ltd., 1961 (Sixth impression 1969). ISBN 0-356-01448-7. Hagedorn, Dan. "Curtiss-Wright Model 21". Skyways, The Journal of the Airplane 1920-1940, Number 77, January 2006. Miranda, Justo and P. Mercado. "Curtiss-Wright P-248-01". Unknown! Number 4; Madrid, Spain, 2006. Munson, Kenneth. Fighters Between the Wars 1919-1939 (The Pocket Encyclopedia of World Aircraft in Colour, Blandford Colour Series). London: Blandford Press Ltd., 1970. Taylor, John W.R. "Curtiss-Wright CW-21." Combat Aircraft of the World from 1909 to the present. New York: G.P. Putnam's Sons, 1969. ISBN 0-425-03633-2.